» Publishers: Are You Making These Seven Common Monetization Mistakes? Publishers: Are You Making These Seven Common Monetization Mistakes? For a lot of website owners, Google AdSense (or another ad network) is a primary source of revenue. Yet many have a far-from-optimal implementation of AdSense on their websites, which means they’re effectively leaving money on the table with each visitor that comes through. One of the biggest decisions relates to serving text ads or image ads on your site: you have the option of showing only image-based ads on your site or including text ads as well. Many get uncomfortable serving text ads, feeling that these are too “spammy” and indicative of a lower quality site. That’s probably true; a site with slick flash ads images just seems to be of higher quality than one with text ads only (note the comparison above). But it’s also undeniably true that text ads work. They make more money, all else being equal, than image-based ads. So utilizing exclusively image ads means that you’re leaving money on the table in exchange for the higher indication of quality that comes by not having text ads all over your site. For some properties, the “brand value” derived from showing only images may make it worthwhile. But be aware that this decision costs you a significant amount of cash revenue; make sure you know just how much it costs you. The general piece of advice here is to conduct ongoing experiments with your monetization strategies. Don’t be afraid to be constantly testing sizes, colors, layouts, and other factors in an effort to find just the right mix. Another easy win on the display ad side can come from literally adding a bit of color to your site. If you’re running AdSense (or a similar display ad network) on your site, odds are that you’re running the default color scheme that was in place when you initially activated your account. Experiment with different color schemes with your AdSense ads; try colors that both blend and clash with the rest of your site and see how the CPMs change as you vary the colors. Check out a great post from Caimin Jones for more thoughts on how to boost your AdSense earnings. Websites that make money primarily through display advertising often put surprisingly little thought into the layout of their page–where the content, ads, and other “calls to action” are physically located. That can have the undesirable side effect of limiting the revenue potential of your site, especially if you’re making money on a CPC basis. If you put your ads in a place where visitors are unlikely to notice them–and therefore unlikely to receive the advertisers’ messages–the performance is going to be poor. You may be surprised at how important the page layout is, and how significant the improvement in revenue can be by thoughtfully placing banner ads within a page. 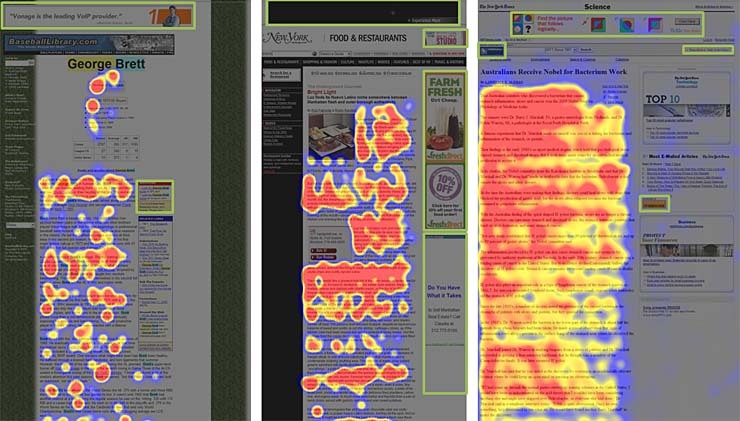 Check out these articles for more insight on banner blindness, and hopefully get some inspiration for how to improve the layout of your site to boost display ad revenue (as well as affiliate and premium product revenue). If you’re not collecting email addresses and building a contact database, you need to reconsider your strategy. Email addresses are easily monetized in many verticals; there is almost always someone who would be happy to pay you for access to your audience (not to mention the fact that it provides you the flexibility to market your own products / services). Launching a newsletter is the easiest way to encourage visitors to give you their email address (as well as generate additional pageviews by making transient visitors into repeat users). Even if you’re not quite ready to start monetizing these email addresses, you can certainly start collecting them immediately (which will increase your payout down the road). Check out this post from GetResponse on places where you may be missing out on email capture; odds are you’re dropping the ball on at least one of these. It’s important to note that you need to also be careful about communicating your intent to monetize email addresses to your audience before you collect them; if you don’t let them know that you may send them third party advertisements from time to time, you could be setting yourself up for legal headaches. If you sell a “premium” product or service on your site, there is a lot of work you can put into optimizing that entire process. One of the most significant changes you can make includes adding multiple tiers of service. 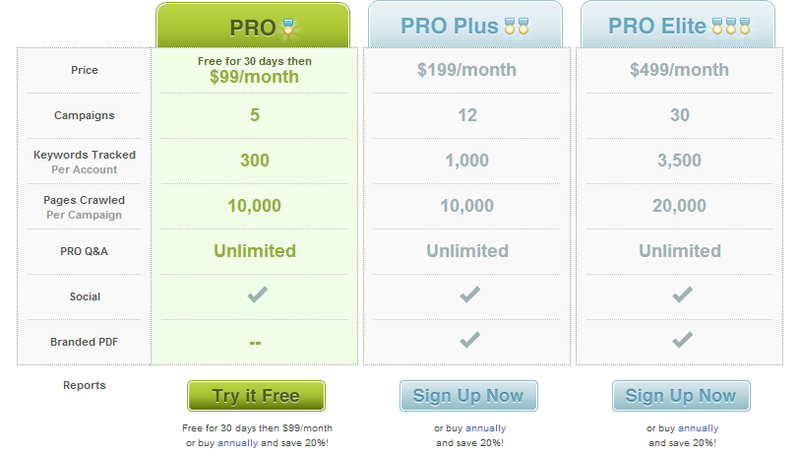 At its simplest, this would be having both a “base” level (say $19 / month for this example) and a “gold” level that includes more features at a considerably higher price point (say $99 / month in this example). The reason: there is a part of just about every demographic that will always pick the highest pricing tier and highest level of service. The presence of a higher pricing tier will also help to enhance the apparent value add of the lower tiers; users will feel they’re getting a bargain by taking only some of the features at a much lower price point. For more on this topic, check out a great post from Nathan Barry at ThinkTraffic. Another monetization technique that perhaps gets a bad rap is in-text ads. 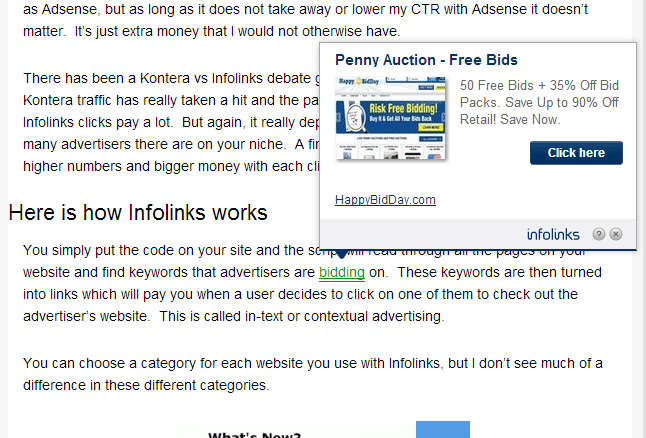 You’ve probably seen these somewhere: linked text within a piece of content that display ads when hovered over. These text ads can be extremely effective when implemented correctly in the right niche, allowing you to reach an audience that would be otherwise banner blind. In-text ads aren’t going to be a good fit for every site, but if you run a property in a niche with high CPC and CPM rates, you might be pleasantly surprised at the impact that throwing in text ads can have on your overall earnings. If you have an affiliate marketing relationship in place, or if you have any kind of products / services that you sell on your site, let your audience know what they can be doing to support you (i.e., making you money by supporting your affiliate advertisers). This can be as simple as firing off an email that lets them know what they can do to make you money. Of course, you’ll want to put some thought into how you phrase it; you’ll probably be much more successful if you ask them to help you keep your content free as opposed to asking them to fund your vacations. This can be particularly effective if you provide high quality content to your audience for free; if they recognize the value you add at no cost to them, they are likely to be willing to support you. A lot of website owners feel uncomfortable emailing their audience and asking for support. Don’t. You’ll be surprised at the response you get; being straightforward about your affiliate marketing relationships and aggressive in asking your audience for support can pay big dividends. When monetizing a website there is always a temptation to seek out the home run that is going to send your revenue skyward. But it’s much more realistic (and effective) to cobble together a series of singles and doubles that will gradually boost earnings. Above we’ve laid out a number of relatively easy changes that can potentially have a big impact on your overall monetization picture. The key, as always, is to be willing to experiment and disciplined in your evaluation of what works and what doesn’t. Have another tip for monetization or mistake you see a lot of publishers make? Let us know in the comments below!